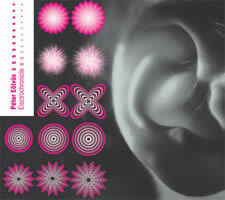 “Electrochronicle.” Péter EÖTVÖS: Music for New York (1971/2001); “Now Miss!” (1972/2002); Electrochronicle (1974); Dervish Dance (1993/2001). Budapest Music Center Records BMC CD 072 (http://www.bmcrecords.hu/). Listen to a sandbox. BMC opens a fascinating view onto an original creator’s work with “Electrochronicle,” wherein Eötvös revisits 1970s electroacoustic work and improvisations. But it’s not unsupervised play. Each piece involves lines crossing themselves or other lines. Music for New York straddles 30 years. Improvising in 2001, soprano sax (László Dés) and bodhrán (András Dés) intersect with a 1971 tape of Eötvös doodling with zither, hurdy-gurdy, and synthesizer. Just like life in the city it’s named for, everyone goes about his own business neatly stepping around everybody else. Something about the saxophone’s piercing resonance casually blended with gently bumbling electronics calls up a lazy summer’s day in the big metropolis. “Now Miss!” (based on Beckett’s Embers) dusts off a 1973 recording of violinist János Négyesy with the composer at electric organ. For this release, Eötvös added sea sounds: Foaming surf crashes over the taped duet. While the instruments in Music for New York mingle, the keyboard and violin are lonely and isolated. The water threatens to wash them away. Dervish Dance layers three unsynchronized versions of clarinetist Csaba Klenyán tackling Eötvös’ solo of the same name. Short and sweet, the clarinet’s vacillating pitch weaves an eerie tapestry. Breathy flutter-tonguing and piercing high notes mimic a malfunctioning machine rather than a dancer. I prefer this “trio” to the solo Klenyán offers on his recital disc, BMC 059. Eötvös and Mesias Maiguashca play electric organs whose sound has been transformed by synthesizers in Electrochronicle, the 1974 title work. Fixed on tape before vanishing forever, these seven diary-like pieces varying between 0:17 (June 5) and 5:20 (June 13) capture hard-won setups and fleeting sounds. The early 1970s must have been an exciting time for Eötvös. As always, BMC releases a pretty package. Fluorescent pink accents a black-and-white ear. Remember the cool geometric drawings you could make with a Spirograph? There are a few of those here, too. (1980-81); Ludwig van (1969); Der Eid des Hippokrates (1984); Unguis incarnatus est (1972); MM 51 (1976). Alexandre Tharaud (piano), Philippe Bernold (flute), Hervé Joulain (horn), François Le Roux (baritone), Eric La Sage (piano), Marc Marder (bass), Jean-Guihen Queyras (cello), Ronald van Spaendonck (clarinet), Choeur Rémusat. Aeon AECD 0311 (http://www.aeon.fr/). Distributed in the US by Harmonia Mundi (http://www.harmoniamundi.com/). Leavened with ample dramatic and nonmusical effects, Kagel’s music always entertains, a nonchalant demeanor obscuring the Argentine-born composer’s incendiary thoughts. 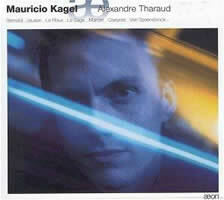 The bright little French label Aeon presents busy pianist Alexandre Tharaud in a perfect introduction to Kagel’s multi-layered world. is a collection of organ pieces, every title beginning with “r.” Tharaud has transcribed five for piano. The first, “Ragtime-Waltz,” stutters drunkenly. Is it a rag or a waltz? Make way for a demonic version of both, a sounding interpretation of an entry from Ambrose Bierce’s The Devil’s Dictionary, despite Ferdinand Hirsch’s less fanciful Wörterbuch der Musik having been the starting point. “Rondeña,” “Rosalie,” and “Râga” perpetuate the nonsense. “Rossignols enrhumés” (Nightingales with colds) tosses items directly on the piano strings, causing them to buzz and rattle. Kagel undermines performance practice with Ludwig van. Taking “as played in Beethoven’s day” a step further, the Master’s music is rearranged to emphasize what a deaf person might hear. Composed as soundtrack for his film, Ludwig van is quintessential Kagel (DG ought to reissue its recording), a distorted transcription in nine sections for instruments and chorus. Suggesting the sacred while actually describing a common medical condition, Unguis incarnatus est’s Lisztian wisps succumb to insistent pedal-pounding that culminates in shrieks from Tharaud and double-bassist Marc Marder. Eric Le Sage assists Der Eid des Hippokrates, a perverse three-handed piece for one piano. In MM 51, Kagel’s nod to Schoenberg’s Begleitungsmusik, Tharaud battles a metronome against silent-film clichés and their accompaniments. Tharaud has recorded wide-ranging repertoire for Harmonia Mundi and Naxos. Anything he touches is highly recommended. A willing chamber-music partner, Tharaud supports cellist Jean-Guihen Queyras in a Hungarian recital featuring Kodály, Veress and Kurtág (HMC 901735). With flutist Philippe Bernold, he presents an excellent set of 20th-century French basics: Boulez, Messiaen, Jolivet, Dutilleux and Varèse (HMC 901710). Milhaud’s piano music with Madeline Milhaud narrating is Naxos 8.553443. You read it here first: Ravel’s complete piano works (HMC 901811/12) is a spectacular recent release destined to win prizes and acclaim. Also keep an eye out for Aeon. Alongside releases of contemporary composers Hugues Dufourt, Michaël Lévinas, Gérard Pesson and Bruno Mantovani, they offer the Ysaÿe Quartet playing Haydn’s Op. 54 and Felicity Lott singing Chausson, Ravel and Duparc. 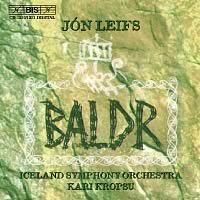 Jón LEIFS: Baldr, Op. 34 (1943-47). Gunnar Guðbjörnsson (tenor), Schola Cantorum, Iceland Symphony Orchestra, Kari Kropsu (cond.). BIS CD 1230/1231 (http://www.bis.se/). Distributed in the US by Qualiton (http://www.qualiton.com/). An oversimplification for the impatient: Leifs is Iceland’s Revueltas. Restoring the cognoscenti’s faith in the recording industry, BIS has been a great proponent of Iceland’s most famous 20th-century composer. A passionate advocate for his country’s culture, Leifs’ mature compositions have a distinctive sound: bare textures built upon open fifths, strong lilting rhythms derived from folk music, prominent percussion (including rocks and chains), and simultaneous extreme orchestral sonorities (bassoons paired with piccolos). Leifs’ life was not easy. Trained in Leipzig in the 1920s as a conductor, pianist and composer, he remained in Germany through the turbulent ’30s. The Nazis appropriated his Nordic-inspired music to further their artistic goals. Leifs shared the bill with Wagner in a 1936 Berlin Philharmonic concert. The tides turned after the 1941 premiere of his “primitive” Organ Concerto, Op. 7, and Leifs quickly became persona non grata. Removing his family to Sweden in 1944 did not keep it intact. The next year he divorced his wife and moved to Iceland, where he would spend decades trying to clear himself of Nazi complicity. In 1947 one of his daughters drowned off the Swedish coast. He grappled with his loss in the short a cappella Requiem, Op. 33b, the second string quartet, Vita et Mors, Op. 36, and other works. The movie Tears of Stone (1966) is about Leifs. Leifs gained fringe notoriety through a few terrifyingly loud orchestral works representing natural forces. Iceland’s largest 20th-century volcanic eruption inspired Hekla, Op. 52 (1961), in which chorus, organ and orchestra are enhanced with rocks, sirens, chains and anvils (BIS 1030). Illustrating drifting ice, Hafís, Op. 63 (1965), for chorus and orchestra, also gradually builds intensity (BIS 1050). Baldr’s fourth movement depicts a hurricane. The final scene is another thundering volcanic eruption complete with anvils, bells and chains. Spread across 90 minutes, Baldr’s two-act choreographic drama relates brutal confrontations between good and evil, the Nordic gods Baldr and Loki. The first of 13 scenes, “Dance of the Creatures of the Earth,” unfolds like a creation myth. There’s a love scene and a wedding, several fights, and eventually Baldr dies. Some scenes are miniatures, others are grand tone poems. Solo voices and choruses contribute sound effects as well as text settings. This gargantuan work is an improbable concoction of noise and transcendent beauty. The Iceland Symphony executes Baldr with panache. My token Icelandic experience is a layover in the Reykjavík airport on a cold but clear January day. I remember an elemental landscape filled with water, ice, snow and volcanic rock. Of BIS’ Leifs releases, the two-disc Baldr most reminds me of that brief visit. Other BIS CDs group Leifs’ music by medium. A smattering of orchestral songs is on BIS 1050. The Yggdrasil Quartet plays three string quartets on BIS 691. Peruse the booklet for the strangest publicity photo ever: Two men are dressed in black-tie, two others are menacing and naked. 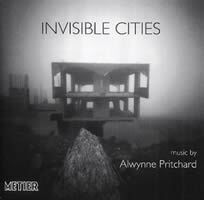 “Invisible Cities.” Alwynne PRITCHARD: Spring (1996); Piano Quintet: Barbara Allen (2000); Nostos Ou Topos (2000); Matrix (2001); Der Zwerg (1998); Kit (1999); Der Glücklose Engel (1999); Invisible Cities (1999). Topologies: Guy Cowley (clarinet), Alan Thomas (guitar), Darragh Morgan (violin), Chris George (violin), Bridget Carey (viola), Betsy Taylor (cello), Alan Thomas (guitar), Ian Pace (piano), Alwynne Pritchard (voice). Metier MSV CD92040 (http://www.metierrecords.co.uk/). Kit comprises a grid with pitches and performance instructions. The vocalist must locate mathematical, instructive or scientific texts and read them dramatically. Accompanied by electric guitarist Alan Thomas, Pritchard reads Newton’s Pricipia and the Spanish instructions for her food processor. The composition’s most intriguing aspect passes unnoticed: The vocalist tunes into Handel over a Walkman, a musical layer which informs the performer but remains hidden to the audience. Pritchard is flourishing in fertile ground. However, listeners without firsthand experience of the liberty of unstructured music might be nonplussed. Excepting the electric instruments in Matrix and Kit, Pritchard’s sounds and melodic material are disconcertingly conventional, inconsistent with her stance. On rehearing Nostos Ou Topos, Pritchard’s allusion to Webern’s shortest orchestral sentence, Op. 10, No. 4, became evident. This guitar composition, which Pritchard specifies must be played twice in succession, consists of three movements presented one above the other, the guitarist “weaving them together to create a single line.” A hearty serial vocabulary hides in the contours of Invisible Cities, Spring and Der Zwerg, two other solo piano pieces, and Der Glücklose Engel for clarinet, violin and cello. Even the German titles suggest zwölftonery. This last trio, examined in the context of the surrounding flexibly organized pieces, is the most abstract, with varied textures. In the booklet, pianist Pace interviews Pritchard: She distances herself from the trio’s romantic and expressive concerns, preferring freer forms. Frankly, I think a rapprochement of both worlds would be most providential. 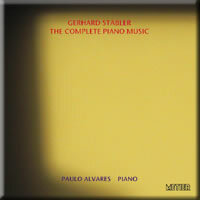 “Complete Piano Music.” Gerhard STÄBLER: Dalí (1995-96); Traum 1/9/92 (1992); Internet 1.1 (1996); Internet 1.5 (1996); Internet 1.9 (1996); Windows (1983); Total (1986); Von Branntwein und Finsternissen (1992); Hart auf hart (1986). Paulo Alvares (piano). Metier MSV CD92075 (http://www.metierrecords.co.uk/). ” (Koch Schwann 3-1140-2), an excellent though hard-to-find portrait disc, features the Arditti Quartet, Ensemble Modern, Teodoro Anzellotti, et al. With this double-disc set devoted to piano music, Metier brings English-speaking audiences up to date. Inspired by a miners’ strike, Total elicits violent splashing chords played at a breakneck tempo from an almost indecipherable score of staves, graphs and instructions. Von Branntwein und Finsternissen prescribes whistling and harmonica within its brief 70 seconds. Pianist Paulo Alvares takes 4:41 to realize Hart auf hart, a graphic score of collaged bar codes. Clearly Stäbler stands outside tradition: Other compositions have released scents into the air. Windows comprises five quasi-elegiac miniatures. My favorite is the second which tarries with an alluring phrase, repeated almost obsessively with minute modifications. Recorded in Saarbrücken, German radio stations contribute competitive noise for Internet 1.5. This piece and Internet 1.9, which requires vocalization of nonsense syllables, were both written for Alvares, a pianist of formidable talents and endurance. Nobly aspiring to release Stäbler’s entire piano oeuvre, Metier includes Dalí, a long sprawling thicket which pays homage to surrealist Salvador though cryptically manipulated Schubert sonatas. Pruning Dalí, two discs could have comfortably become one, and we would still have a comprehensive portrait. Bernd Alois ZIMMERMANN: Intercomunicazione (1967); Capriccio (1946); Sonata for Violin Solo (1951); Four Short Studies for Violoncello Solo (1970); Présence (1961). 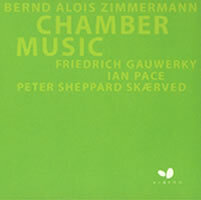 Peter Sheppard Skærved (violin), Friedrich Gauwerky (cello), Ian Pace (piano). Albedo ALBCD 022 (http://www.albedo.musiconline.no/). Norwegian label Albedo triumphs with B.A. Zimmermann’s chamber music performed by three hard-working talents. Violinist Peter Sheppard Skærved keeps busy with the Kreutzer Quartet and solo endeavors. A recent release is Rochberg’s mammoth Caprice Variations on Metier MSV CD92065. He’s joined by dynamo pianist Ian Pace (another Metier mainstay) and cellist Friedrich Gauwerky, one of the few who’s dared to tackle and record Ferneyhough’s Time and Motion Study II for cello and electronics. Zimmermann is not casual listening. The polystylistic works for large forces can be fun, Les Soupers de Roi Ubu a brilliant favorite. Zimmermann reveals a tremendous intellect in his drier chamber music. Intercomunicazione, a bleak duet for cello and piano, “two basically incompatible partners,” has been definitively set down by cellist Siegfried Palm and pianist Aloys Kontarsky (DG 471 573-2). Matching the senior pair’s intensity, Gauwerky and Pace’s new recording benefits from crisp sonics that shade every expression. Présence is hardly standard piano trio fare. With its subtitle, “ballet blanc en cinq scènes,” and Don Quixote, Roi Ubu and Molly Bloom for its characters, past and present, allusion and imagination are commingled over a grueling 25 minutes. The shorter works are close to perfection. Pace provides a spirited piano solo, Capriccio, Improvisations on Folk Song Themes, with subtle nuances in touch and phrasing to delineate the source folk songs. Skærved reads the Sonata for Violin Solo rather vividly. He also contributes an essay on playing it, making connections with Hindemith’s and Henze’s solo sonatas. Zimmermann’s virtuosic cello quirks are summarized in the Four Short Studies which Gauwerky plays effortlessly.